The overall aim of National Service as envisaged earlier is to give an extension dimension to the higher education system and orient the student youth to community service while they are studying in educational institutions. 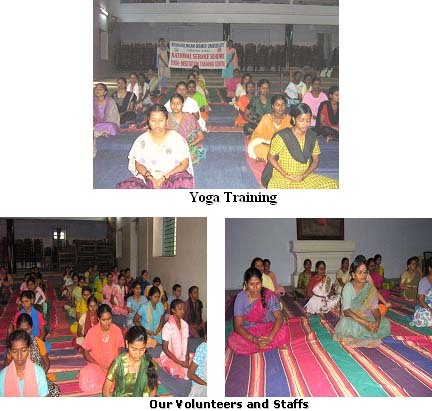 The university also has a yoga center where yoga is taught to the NSS volunteers. Yoga promotes physical and mental health. It disciplines the mind and improves the power of concentration. Each NSS volunteer has to put in 120 hours in a year for both regular and special activities per year and 240 hours for two years. 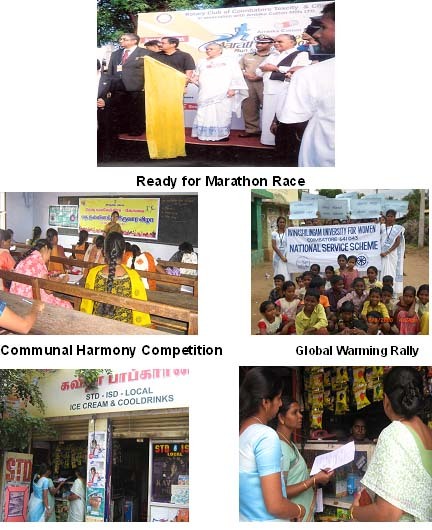 The NSS regular activity during the period 2003 to 2007 was carried out in the 35 adopted villages around Coimbatore. The following components were planned and executed at the Villages. 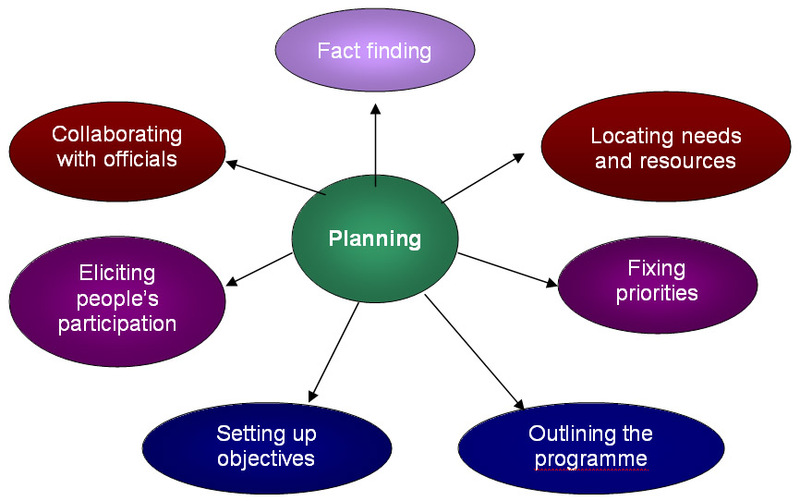 Preparation of teaching aids, charts play materials and models for schools. Inculcating proper eating habits, improving behavioral aspects, health and nutrition education, and sanitary cleanliness and ensuring physical exercises for school children. The NSS Programmes are undertaken, either under regular or special camping covers four aspects. Institutional work : The students may be placed in selected welfare agencies out side the campus to work as volunteers. Institutional Projects : Improvement of campuses, construction of play fields, swimming pools etc. Rural Projects : Eradication of illiteracy, Minor irrigation works, agricultural operations, health, hygiene, sanitation, development of rural roads etc. Urban Projects : Adult education, welfare of slum dwellers, training in civil defence, setting up first aid posts, hospital work etc. The National Service Scheme (NSS) then called National Service Corps (NSC) was initiated on September 24th 1969. It was inaugurated on 3rd February 1970 with two NSS units of 100 volunteers each in the Sri Avinashilingam Home Science College. Over the years, the NSS had been strengthened and at present there are 30 units with 3020 volunteers. The NSS has become a major student youth Programme and it is implementing a number of innovative and community based programmes. The integration of NSS with the curriculum is a unique distinction of Avinashilingam Deemed University from 1991. While the scheme has all along been voluntary, educationists have started thinking about incorporating it in the curriculum itself to give it an academic status, credibility and credit. Avinashilingam Deemed University which has a rich heritage in community service and out reach activities had the urge and courage to pioneer in this noble venture and introduced NSS as a core subject in the undergraduate curriculum. The syllabus for NSS was prepared by the Board of Studies and approved by the University Academic Council. The syllabus consists of theory as well as practical components. The Revised syllabus for National Service Scheme for 1st and 2nd year under Graduate Majors (Common paper to all majors except NCC Students) and Break up of marks for NSS (Theory and practical Papers) are presented below. To instill the concept of service in students. To expose the students to the activities of National Service Scheme. Department of Youth affairs and Sports, 1994. Indian youth in perspective, Govt. of India, New Delhi. NSS - Manuals and Reports. Educationally, the curricular component needs to be integrated with the developmental activities in the community; such integration would bring realism to the courses of study, since the subject matter studied can then be applied to life situations. In CSS, the students understand the communities around them and identify themselves with their aspirations, needs, problems, resources and plans, and educate the masses for their development. The major and unique educational innovation, the University brought forth has been incorporating Community and Social Service (CSS) in the curriculum at the post graduate level with academic weightage and credibility. The pattern has been systematized in such a way tha the entire gamut of PG students and over 25 per cent of the staff body at a time reach out to the community, giving a frontal attack to the problems of women and children in the neighbourhood. The Home Science Extension Department as a branch of specialization of the Faculty of Home Science has made its mark to establish the credibility of the University as a centre of excellence in community outreach involving students with focus on 'Women Empowerment'. The major tasks of CSS are cooperatively determined to promote action achievable by the level of maturity of the group, permitted by the available resources and defined in terms of behavioural changes among students and the members of the community. become aware of the family structure, caste and value system, needs and aspirations of the people in the community adopted. understand how to mobilize the resources available in the community- both human and material. develop skills in human relations and in working with the community. inculcate positive attitudes towards women development. aspire for strong, constructive relationships between themselves and the community, making way for desirable changes and development of leadership. The students and staff are oriented thoroughly on the objectives of CSS in order to plan, execute and evaluate meaningful activities for the communities. The postgraduates with specific goals, steering for career opportunities with matured mindset are well prepared for taking up organized tasks for sustainalble development of the society. The syllabus for the same is chalked out, keeping in view the challenges they will be facing in the society, the satisfaction they should derive by discharging their duties and responsibilities. The University has allotted two hours per week for the post graduates for two semesters. 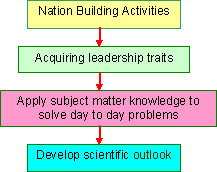 In order to develop the competencies required to guide students effectively and monitor the CSS, the staff in charge of CSS are adequately trained about the community life and programmes of development, techniques of working with people, utilizing the infrastructure and evaluating the students and the outcomes of CSS work.). Each semester had a weight age of 25 marks attributed for CIA (Total 50/2 semesters), the comprehensive examination carried a weightage of 50 at the end of II semester. The total weightage is 100. In the year 1968. It was started with 50 cadets. Our university is one of the subunit in the coimbatore group. At present we have 160 cadets with two ANO's. Regularly 40 parades will be conducted per year in our campus. In addition to parades our cadets are attending various camps. To develop the social service among the cadets special activities are conducted every year..
Defence Exhibition was conducted on 08.02.2013 at Ettimadai and 20 Cadets participated, and gained knowledge about different sectors of Armed Forces. A Cancer Awareness rally was conducted on 10. 07.2013, 127 cadets participated to create awareness on the importance of early diagnosis of identification of cancer. It was inaugurated by Dean of Students Affairs Dr.S.Rohini (Prof). Blood Donation Camp was conducted on 03.08.2013 at campus-I, it was organized by 6 Medical NCC, Battalion, Coimbatore. 110 students and 10 staff members donated their blood. Cycle Rally was organized on 10.08.2014 for the purpose of creating awareness about prevention of Child Labour. Hundred and two cadets and two ANOs participated, which received good response from the public. In connection with World Disabled Day on 03.12.2014, an Awareness Rally was conducted on disability. One sixty cadets and two ANOs took part in awareness rally. It was inaugurated by Hon.Col.Dr.Sheela Ramachanran, Vice-Chancellor of the university. International Yoga Day was celebrated on 21.06.15, held at Government Arts and Science College, Coimbatore. 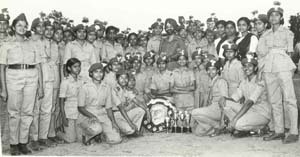 It was organized by 5(TN) NCC Girls Battalion. From our university one sixty cadets and two ANOs participated. Swatcch Bharath Cleaning campaign was organized on 06.08.2015 in Campus-I, 120 cadets participated and cleaned our campus. Swatcch Bharath Cleaning campaign was organized on 11.03.2016 Campus-I, in which 150 Cadets participated. International Yoga Day was celebrated on 21.06.16, held At Government Arts and Science College, Coimbatore. It was organized by 5 (TN) NCC Girls Battalion. From our university one sixty cadets and two ANOs participated. Aazadhi-Candle Light March was conducted on 14.08.2016 to recognize the services of Freedom Fighters. One sixty cadets and two ANOs participated. International Yoga Day was celebrated on 21.06.16, held at Avinashilingam Institute for Home Science and Higher Education for women, Coimbatore. It was organized by NCC, NSS and Sports, seventy cadets and two ANOs participated. Cleaning Program was organized regarding Swatcch Bharath Campaign and 117 Cadets Participated. Anti Corruption Rally was organized and 132 Cadets participated in rally spreading the message against Corruption. A Survey was conducted on Digital India. 120 cadets and two ANOs took part in the survey, for shaping India into a digital nation. Anti Ragging Rally was organized on 21.05.2016 at Campus - I, one fifty Cadets participated and spread the message on anti ragging. An awareness programme on Armed Forces and the significance of the day was celebrated on 07.12.2017 in which Lt.Eden (Navy) delivered speech on significance of Armed Force personnel in protecting the sovereignty and integrity of our country. International Yoga Day - 21.06.2017 was held At Government Arts College, Coimbatore, 99 Cadets participated. Survey on Digital India was conducted on 07.08.2017 and 05.09.2017, 150 Cadets participated in the survey. Cleaning the Streets was organized as a part of Swatcch Bharat Campaign, over 88 Cadets participated. Tribal Day was celebrated in a Tribal Area- Anaikatty on 09.09.2017, 98 Cadets took part. Flag Day was celebrated on 07.12.2017 and various competitions were held as part of the programme. 01.12.2017- Inauguration of the event with cleanliness drive and pledge. 02.10.2017 Awareness Rally Phase-I and distribution Swachhta Awareness booklets. 07.12.2017- A Poster making completion on Swachhta theme was organized. 08.12.2017- Mass Awareness Rally Phase-II on distribution of Swachhta awareness booklets. 12.12.2017- Cleaning of School outside University Campus with the help Local Body Staffs. 14.12.2017- Mass Awareness Rally (Phase III) and pledge taking and distribution of booklets was done. 15.12.2017- closing function on Swachhta Pakhwada was organized.